I love sharing recipes with you. Here’s one for a concoction you can make to de-skunk a dog. I had to use it when Bogie tangled with the resident skunk at our favorite park. After some quick Googling, I learned that a tomato juice bath isn’t as effective. Visitors to my website comment frequently on the short welcome video I created for the homepage. It welcomes people to the site, explains how I can help them, and invites them to email me with a question. It even features my dog, Bogie, who sits patiently before devouring her treats. It’s called an explainer video. A well-done video can grab people’s attention. And it can prompt a journalist to call you. You’ll love the handy infographic I found that’s the Ultimate Guide to Creating a Killer Explainer Video. 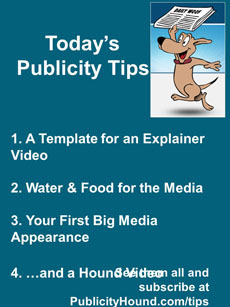 It lists the 12 types of explainer videos and the four steps to follow. Don’t be discouraged by the high prices next to each type of explainer video. These are probably what you’d pay a big agency to produce it. Then hop on over to my blog and submit your best idea for last week’s “Help This Hound” feature. Publicity Hound Pat Sabiston needs ideas on how to publicize a doctor client’s 20th anniversary. If she likes your idea best, you can win a $50 coupon for any of my products. I’ll announce the winner next Tuesday. If you’re sponsoring a big media event this summer, have plenty of bottled water on hand. Reporters, photographers and TV crews usually race from assignment to assignment, and have little time to stop for lunch or even a bathroom break. During these hot summer days, they’ll appreciate the offer of cold bottled water. If you’re serving snacks at your event, invite them to partake. If it’s a big news event, they’ll also appreciate a quiet place to work on their laptops and recharge their phones. And set aside close-to-the-event parking for the media. These are just a few of the tips I share in my Special Report #43: The Do’s and Don’ts of Offering Food to the Media. Learn who pays the bill if you’re taking a reporter to lunch (it’s not who you think), guidelines for serving alcohol at your event, and rules that regulate gifts of food. Only $15. Order at my shop. If your publicity goal includes booking a spot on “Good Morning America,” the “Today” show or “Fox & Friends,” first get experience on TV shows in small markets, like in your hometown. It will give you a chance to make mistakes and learn from them. You’ll also feel much more comfortable in front of the camera when you hit the big-time. Ditto if you’re trying to get into a major story in the New York Times. Get experience talking to reporters at smaller newspapers first. How do you jump from smaller media outlets to larger ones? It isn’t about who you know but how you pitch yourself. 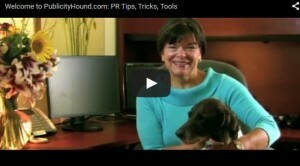 You’ll learn how to convince the media they need to interview you NOW, 5 proven ways to shape your message, an easy way to parlay local publicity into national publicity, and lots more. Register at here. The call is free. I’m Steve’s affiliate and earn a commission if you buy anything from him down the road. Here’s another Subaru video featuring The Barkley family. Mr. Barkley’s roaming eyes get him in trouble.